Having a pet and traveling with them can quickly become a difficult task. Only when you make sure that your dog is comfortable, will he be able to travel with you without bothering or feeling bothered. 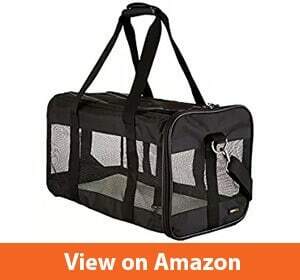 The best travel dog crate is one, which will make your pet feel as comfortable as at home, allowing them to rest, tanking energy for when you arrive at your destination. As there are so many products out there, it will save you time to look at some of the best dog crates available before deciding on which one to get. This travel crate is great for long travels as well as shorter outings. It is made out of mesh fabric, which is tightly weaved and these mash panels are surrounded by a steel frame, which is extra strong. It is best suitable for dogs who have up to 70 pounds. It is important for these dogs to always be supervised when in this portable crate. 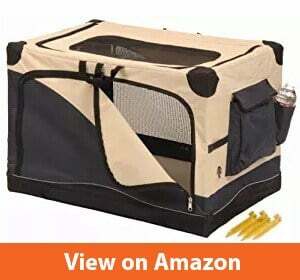 It is very easy to assembly this travel dog crate and folding it is just as easy. It will all last a couple of seconds and you won´t need to use any tools at all. The measurements of this travel dog are 36 x 25 x 25 inches. It is important to measure your pet correctly to make sure that the travel dog crate will fit. When measuring, start by measuring the top of the head to the floor. This is how to measure the height of your dog, while the crate needs to be two inches taller than this. To measure the length, measure your pet from the tip of the nose to the base of the tail. The crate needs to be four to six inches long. It is very simple to clean the crate as its material is water-resistant. You can simply wipe clean the crate, after removing any pet waste and if you feel a more extensive cleaning is necessary, the cover is removable and machine washable. 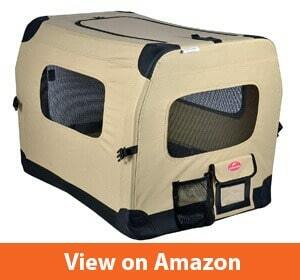 This travel dog crate comes with three doors and has a side door that is larger, for the easiest access possible. The frames of this crate are made out of strong steel and are cover is made out of removable fleece. The covers are made out of 600 denier nylon, which is extremely durable. It also contains pouches on the side and on the top of the crate. An amazing feature, allowing you to store your pet´s favorite toys in it, blankets, treats and whatever else your pet might need. The mat is waterproof, making it very easy to clean. Both this interior mat as well as the fleece cover are very skin-friendly and your pet will be able to travel in comfort. The great thing about this crate is that it can be easily folded by just pushing a button. When folded, it takes up very little space, which is great for storage once you have finished your traveling. It measures 25.75 in length, 23.5 in width and 27 in height. This sums up to it being suitable for pets who weigh up to 70 pounds. While the crate has no handles to hold, it is extremely lightweight and very easy to carry around. When your pet is inside of it, this crate is not meant to be moved around. This travel dog crate with three doors for an easy access has the following measurements: 35 inches long, 24 inches wide and 28 inches high, making it 2 inches wider and 4 inches higher than most, standard travel crated. This gives your pet the feeling of having more space and they will appreciate it. This travel dog crate comes already fully assembled, so you won´t need to put in any work towards this. You will also not need any tools to fold it down or set it up, this will be easily done within a few seconds. The frame of the crate is made from steel tube, while its cover is made out of high quality 600D fabric, combined with hex mesh fabric. These two materials allow this crate to be lightweight, while durable. 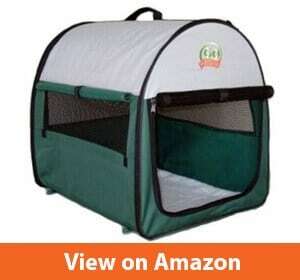 Also, it is well ventilated, providing your pet with the comfort they need. The doors are placed on the top, front and side, which not only helps the pet access, it also gives more sunlight and air in the crate. There are also two pockets available, helping you carry not only your pet but also any accessories your pet might need, like snacks or a dog grooming brush. The cover and the bed of the crate are both easy to wash. This soft travel dog crate will help you give your beloved pet the support they need, wherever you go. When traveling, it is important for the dog to be safe while feeling comfortable. This travel dog crate is made out of lightweight material while being water-resistant and extremely durable. The frames are formed out of metal rods. The door is made out of screen mesh, which allows for enough breathability while in the crate. The adjustable ventilation is provided on all four sides of the crate. 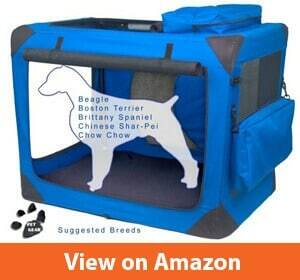 This travel dog crate is able to be used on the inside as well as the outside. You can easily fold it and once folded, it takes 93% less space and is 44% lighter. This makes it easier on the dog owner when it is necessary to move the crate around or store it when at home. The crate also features windows on all three sides, which have a roll-down cover. The floor pad of the crate has been designed to make your pet feel as comfortable as possible and is made out of lambswool. It can be removed for an easier washing, whenever necessary. 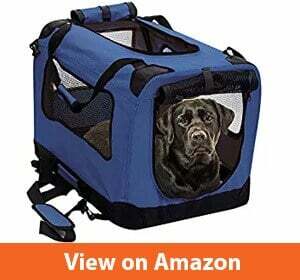 One feature of this travel crate most pets love is that the top can be opened and your pet can stick your head through it to enjoy the traveling even more. This travel dog crate is foldable and can be stored once the traveling is done with, taking up very little space in your home. It is also usable indoors and can be used for training purposes too. It is made out of durable, strong steel tubes as frames, which are at the same time extremely lightweight. Its handles make this travel crate also a good dog carrier. The steel frames are covered with a nylon 600D fabric, which is resistant to water. This cover is easily removed and can be washed in the machine. To remove the cover, a zipper has been placed which is also made out of durable material and your pet won´t be able to chew it into pieces. The windows and the mesh panels are bone-shaped and not only look good, but they also are great towards allowing enough, the natural air in. The mat of the floor is also waterproof and can be reversed if needed. The cushion pad is made out of washable fleece, so you won´t have to worry if any accidents should happen. This cushion pad is highly comfortable too, so it won´t be a difficult task to have your pet stay in it. 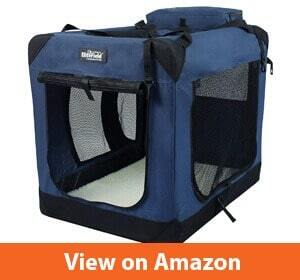 This pet travel crate, which comes in a navy/tan color, is best suitable for pets up to 70 pounds in weight and is suitable to be used indoors as well as outdoors. It comes with four doors, which make it easier for your pet to access the crate. The zippers of the doors are made out of heavy-duty material, to make sure that they last as long as possible. This crate is great for traveling and once you´ve reached your destination, it can be folded quickly, making it easy to store. It will take little space and even includes a carrying case, which protects the crate even when folded. The measurements of this crate are: 36 x 24 x 23 inches. The same type of crates is also available in other sizes, should your pet weigh more than 70 pounds. The crate also features side pockets, allowing you to store any important dog supplies your pet might need when traveling. The floor is made out of hygienic material and won´t absorb any moisture or odors. The crate is also easy to clean and wipe cleaning will be more than enough for this material. The crate is not suitable for unsupervised use and when your dog is in it, you should best be around as well. This travel dog crate has the following measurements: 19.8 x 10.2 x 11.2 inches. It is important to measure your pet to make sure that this size fits. When measuring, it is recommended to measure starting from the neck to the base of the tail, while for height, to measure from the floor to the top of the shoulder. If your pet fits the above-mentioned measurements, then this crate will be perfect for them. It comes with carrying handles and a shoulder strap, that can be adjusted. A feature specially made for the dog owner. The fleece bed is easy to be removed and can be washed in the machine, also helping the dog owner care for it easily. It is also extremely cozy and will allow for your bed to even get a good rest while in this crate. It is recommended for pets who weigh up to 22 lbs, but weight shouldn´t be the only criterium. Length and height should always be taken into consideration as well. The mesh windows of the crate will allow your pet to breath more easily, making them feel comfortable when in this crate. You should not leave your pet unattended when in this crate. When traveling in a car, leave the crate in the back seat to make sure you have your pet in vision. Traveling is a fun activity, whether you are traveling alone or in a company. If you are a dog owner, you might probably be already wondering on all you need to think of, when bringing your beloved dog with you. If you haven´t traveled with your dog before, you might worry about what it will be like. In general, traveling with your pet can be easy and fun, as long as you make sure that your pet has all it needs. Size: the crate should be big enough for your pet to be able to sit, stand and turn around in it. Style: if you are traveling on your car, you should rather choose a crate that has heavy-duty frames, for all those bumps in the road. When traveling by plane, a soft-sided crate is the best choice and that pet travel crate airline must be approved by the airline. Comfort: Travel crates come with cushioned floors for a reason. Especially if you are going on long travels, it is essential to make sure that your pet can get the rest they need while on the crate. There are many crates with special, orthopedic pads, allowing your pet to get the best possible rest while traveling. Choosing the best dog travel crate will not only make for a happy pet, but it will also make for a happy dog owner as well. You will be able to travel in style, while knowing that your pet is safe and comfortable. Also, if the pet gets the rest they need while traveling, they will behave better and be more energetic. After a long traveling, you will be surprised by the energy your dog will have. The easy step dog stairs you might have at home will become easy to climb for a pet that has been traveling in a cushioned, comfortable crate.